I listened to this disc several times on journeys between Widnes and Todmorden over the M6, M65 and Long Causeway with its roadside wind-farms. It's one of the three discs this month that represent the Lyrita gold standard in neglected British tonal music. The other two are the Parkin set of Ireland’s music for solo piano and the Hurlstone double. This disc is the most instantly and enduringly pleasing - an easy winner. There are firstly two short pieces by Coleridge-Taylor. They are sweet yet substantial - the equivalent in style and effect to Dvořák's Romance for violin and orchestra or Svendsen’s Romance or Sibelius’s Serenades. These are bonbons which coax and calm. After the 1897 Légende comes the 1899 Romance. Frankly either of these could have served as the memorable middle movements of a violin concerto. That was to come in 1912. If Beecham were still around either of these pieces would send a concert-hall audience out into the night streets soothed and calm. 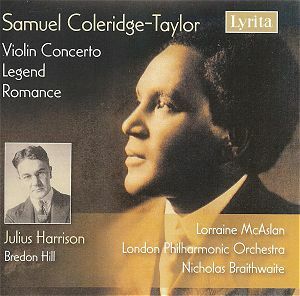 Coleridge-Taylor's Violin Concerto has now been recorded three times. Even though McAslan was recorded long before the Avie and Hyperion discs, Lyrita's long hibernation meant that it was the last to be issued. In summary this is the grandest and most monumental of the three recordings. Listen to the way she takes the theme with such deliberation at 2:03 in the first movement. McAslan played this on the BBC at about the same time the recording was made. The premiere of the concerto was given by Maud Powell in 1912 in the USA after the full score and parts sank with the Titanic. This is a concerto written in direct succession to the Dvorak Violin Concerto and I would say just as good … maybe better. It's not a 'big boy' concerto like the Elgar nor is it a shallow dazzle vehicle. While it is not short of virtuosic demands its emphasis is on a certain grandeur of cantabile spirit. There are two expansive outer movements and an almost sentimental central andante semplice whose moonlit violins have never been as well caught as they are here by the LPO's strings. Every one of the movements has a memorable melody at its core and breathtaking treatment and orchestration - listen to the yawning Tchaikovskian majesty that lifts the andante at 3:54. Tchaikovsky enters again in the bubbling woodwind subsidiaries of the finale at 5:08. The finale uses a lively melody that radiates both happiness and intelligence - the Dvorak may well have served as a model but I also thought of Delius's Florida Suite as well. You may have heard the Coleridge-Taylor Violin Concerto live recently. It was played by Anthony Marwood and the CBSO at the reopening of Birmingham Town Hall on 8 October 2007. A rare event. Julius Harrison's Bredon Hill was written to order as an expression of a cherished England in the depths of World War 2. The studio recording was broadcast worldwide. It looks to two Vaughan Williams works: The Lark Ascending and On Wenlock Edge (Housman) of which the song Bredon Hill is the centre of gravity. This version of the Harrison was recorded, like the other tracks, in 1994 and it would have been the recording premiere had Dutton not pipped Lyrita to the post earlier this year with their (almost) all-Harrison CD. It's a magical work with echoes of the RVW Lark and even of the Elgar Violin Concerto – heard together recently on a fine EMI Classics reissue from Nigel Kennedy. George Butterworth's Rhapsody - A Shropshire Lad is also invoked at 3:57 and elsewhere. Lorraine McAslan plunges into the idiom with a will and with sensitivity to the work's vital poetry. The Coleridge -Taylor concerto is a real feel-good work and deserves to travel far and wide. The whole disc has a life-enhancing glow about it and is an object lesson in natural breathing digital sound.